Protestant pastor Martin Niemöller (1892-1984) became a central figure in the resistance against the National Socialist "coordination" [Gleichschaltung] and ideological infiltration of Germany’s Protestant Church. A staunch nationalist and WWI veteran, Niemöller had been strongly opposed to the Weimar Republic and had voted for the NSDAP up to the Nazi takeover. Shortly after Hitler became chancellor, however, Niemöller turned against the regime. When the “German Christians” attempted to introduce rules restricting church offices to Aryans in 1933, he protested by founding the Pastors’ Emergency League. Niemöller was under Gestapo surveillance staring in 1934; he was deposed of his office that same year. He was reinstated a few months later following protests by his church congregation. He joined the “Confessing Church” [Bekennende Kirche], which lead to his arrest in July 1937. At the time of his sentencing, which occurred about a year later, his prison sentence was considered served, but the Gestapo arrested him again and deported him to the Sachsenhausen concentration camp, where he remained a prisoner until the end of the war. In the postwar period, he co-authored the Stuttgart Confession and remained politically active. 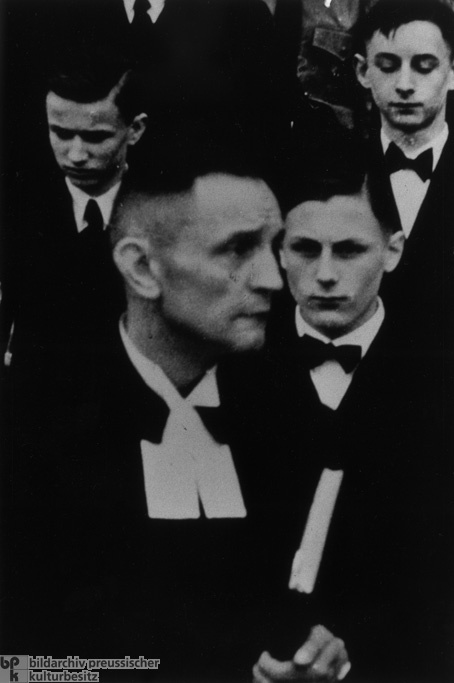 This photograph shows Niemöller with a group of candidates for confirmation from his congregation in Berlin-Dahlem in the spring of 1937, a few months before his arrest.